In the previous videos I've eluded to why you might choose to use a template file or a themeing function at various points in your code. But I just wanted to explain clearly why you might choose one over the other. On the modular level, you have a choice as to what you are going to use and both of them allow you to use preprocessing functions so it's really up to the discretion of the developer to decide which one. 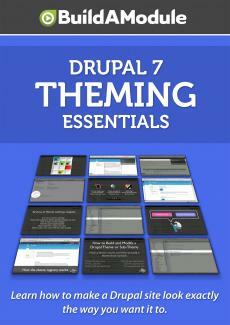 The benefit of using a template file is that the resulting file that needs to be modified by a themer is simpler. You have a single file that's mostly HTML with just a little bit of PHP in it to render certain elements for example in the code. And that may be a lot easier for a certain type of individual to work with than a themeing function, which is a PHP construct that might look a little bit more confusing than a straight up HTML file.